Long a staple of antebellum American newspapers, “ranaway slave” advertisements afford the reader fascinating—if also horrific and heartbreaking—insights into the lives of fugitive slaves and their erstwhile owners. By modern, conservative estimates, more than 50,000 slaves made their runs for freedom every year, running for the closest town, the nearest city, running North for borders that shined like hope, for state lines over which they hoped for succor, or into Canada where they hoped for welcome. The advertisements invariably describe the refugees by the shade of their skin (griff, black, high-yellow), their physical characteristics (lame, large, scarred), their mannerisms (shy, bold, prone to laughing), and their worth in terms of dollars. These little slips of advertising are an invaluable resource in helping to understand the maddeningly complex foreign country that is America during the slave era. 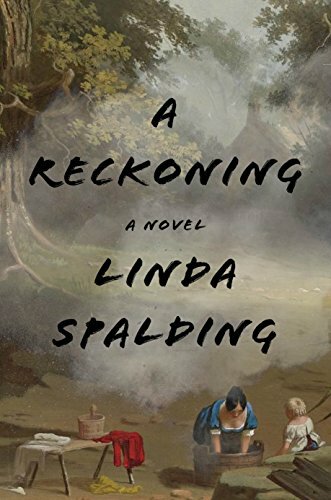 In her novel, A Reckoning, author Linda Spalding deftly evokes the tragic and terrifying experience of the fugitive slave of those advertisements as well as skillfully sketching the bankrupt (morally, emotionally, and, in the case of her characters here, financially) milieu of a not-so-typical slave-owning family. Set in the 1850s, Spalding’s fifth novel is awash with closely-observed detail of the day-to-day living of the times and her ear for dialogue is as precise and true as it is natural and sublime. A Reckoning is a character study, an adventure story, and an examination of the different ways that people can hurt each other. It is the story of Virginia farmer and slave owner John Dickinson, his mountain of debt and the secret that compels him to abandon his family when that debt finally becomes insurmountable. It is also the story of Dickinson’s son, Martin, and his recognition of the rot at the heart of their way of life. And it is story of Bry, one of the family’s slaves who makes a desperate run for Canada and the mother he barely remembers. Spalding’s dense narrative also includes the rest of the Dickinson family and their slaves as well as a host of other characters. Abolitionists, con-men, settlers, and Native Americans are all here, representing a cast you often find in novels about the push Westward during the turbulent decade before the storm of the American Civil War. It is in lovely, character-revealing vignettes that also underscore the alien nature of an America that has not yet opened up, let alone decided what kind of country it wants to be, that A Reckoning most succeeds. If there’s anything to criticize in Spalding’s novel, it is the complexity of her character work and plot. The structure of the narrative demands close attention due to the number of characters and their intersecting plot lines and it is easy to get lost within the sheer length of its dense paragraphs. Relations and relationships between characters are sometimes hard to keep track of and, while the prose is uniformly lovely, the pace of the novel sometimes bogs like a seized wagon wheel. Having never read Spalding’s work before, it would have helped to know that A Reckoning, while not advertised as a sequel to her earlier novel, The Purchase, does extend that book’s narrative. And while familiarity with the themes and characters of The Purchase may ease a reader’s way into the intricacies of this one, it might also imbue A Reckoning with a presence and power deeper than that of the book taken on its own. That being said, the narrative of A Reckoning is no more involved or tangled than the times it is set in. A reader who knows a bit about the America of the 1850s will find much to admire here while those who do not should expect an education after a fair bit of early confusion. A Reckoning is replete with sharply-drawn studies of typical antebellum scenes. The Continental Divide is wonderfully described as is the perilous passage over it via wagon train. Indeed, all the tropes of the pioneer tale are present and given such life and gravitas by Spalding’s characters as to render the conventional or formulaic freshly imbued with poetic gravitas. As it goes along—characters and situations and descriptions accrete steadily as the Dickinsons make their way westward and Bry runs north to Canada—the reader is swept along like a river rushing heedlessly into the foreign country that was once America.